At Plains Midstream Canada (PMC), we value our employees and work to ensure they are operating in a healthy and safe environment. Our commitment to safety is supported by a variety of safety initiatives and programs. 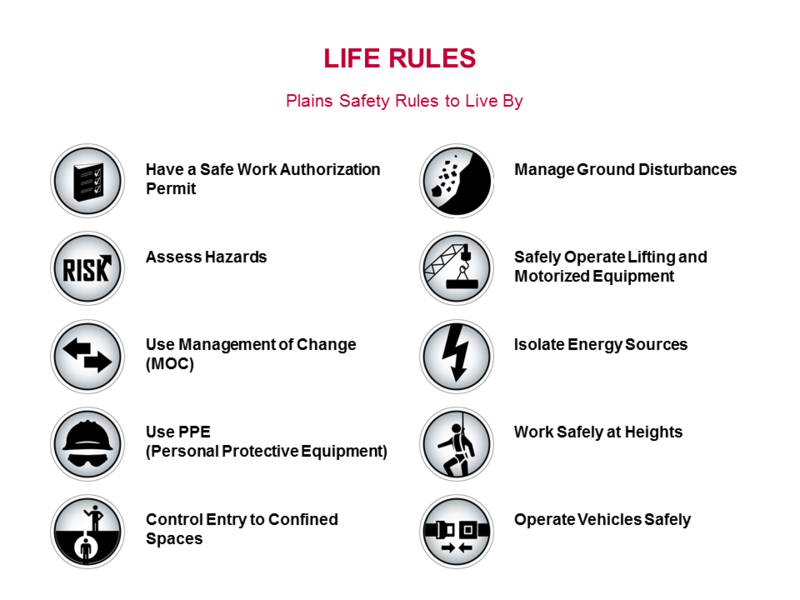 Life Rules is a set of 10 rules every employee and contractor needs to know and follow to continue to work safely. Educational exercises, employee engagement, and follow-up surveys are conducted to ensure the rules are understood and followed. An essential cornerstone of Life Rules is the Stop Work Authority. At PMC, every employee or contractor is responsible for and authorized to stop any work that does not comply with Life Rules, safety policies, or procedures. PMC’s president personally gave his word that no employee or contractor will suffer repercussions for stopping unsafe work. The oil and gas industry recognizes that employees are most vulnerable or at risk in the first six months on the job. PMC provides all new employees, including students, with safety orientation and training as well as a personal safety mentor. They are then given a green hardhat to identify them so experienced workers can mentor these less experienced employees. Green hardhats are worn for at least six months. To emphasize our management’s commitment to safety process, performance and culture, senior managers take part in “walk-arounds.” These are visits to field sites to observe, identify, understand and discuss opportunities for safety improvement. For a set number of times a year, senior managers walk through sites and encourage employees to bring forward any issues or concerns, which are then tracked, investigated and addressed. A visitor is defined as PMC Non-Operations Corporate Personnel, a Regulatory Agency Officer, Media Personnel, Auditors, Community Members, and Third-Party Business Partners. The PMC Incident Reporting and Investigation program involves the proper reporting and investigation of safety incidents to apply corrective actions in a timely manner. Corrective Actions Management program allows for the consistent identification of corrective actions and lessons learned from incidents and investigations to prevent future occurrence.